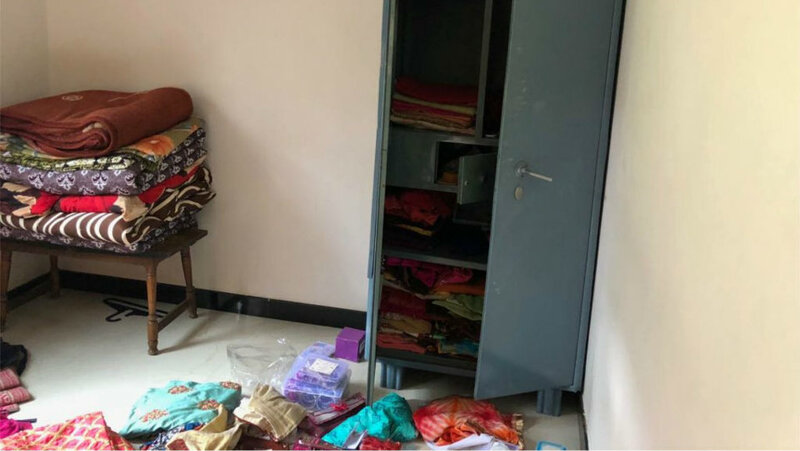 Mysuru: Burglars broke into the locked house of a cloth merchant in city yesterday and looted gold, silver and cash worth more than Rs.18 lakh. The theft came to light when one of the family members returned home in the night. Burglars entered the house after breaking open the automatic lock of the main door. They later managed to open the locker inside a bed room where over 390 grams of gold, 500 grams of silver and Rs. 7,000 in cash were kept. The total value of the loot is estimated to be over Rs. 18 lakh. The theft took place at the house of cloth merchant Ashok Kumar at Halladakeri, behind the bus stop. Ashok Kumar had been to Ahmedabad three days back on a business trip to buy clothes while his wife had been to Bengaluru yesterday morning for Rakshabandhan festival. Ashok Kumar’s son stayed in Mysuru to manage his shop. Yesterday morning after the businessman’s wife left to Bengaluru, his son locked the house at 10.45 am and left for the shop. As usual, he returned at around 10.45 pm and was surprised to see the main door ajar. He then called up his father and mother who told him that they were at their respective destinations. When he entered the bedroom of the house, he was shocked to see the wardrobes and the shelves open. Clothes were shattered and the locker was forcibly opened. He immediately alerted the jurisdictional Lashkar Police Station. A Police team arrived at the house with the dog squad and fingerprint experts. Police suspect that it could have been a daylight robbery as the house was locked. Lashkar Inspector H.R. Vivekananda, City Crime Branch (CCB) ACP B.R. Lingappa, Fingerprint Unit ACP Rajashekhar and Sub-Inspector Appaji Gowda were present. A joint team comprising CCB and Lashkar Police will investigate the case.